The Tivra is designed to support your most intense and dynamic training. It has a unique forefoot design that improves balance and helps support the foot for 360-degree movement. Using rubberized foam, the Tivra ensures immediate responsiveness and cushion when and where you need it. And this confident feel carries through with straps on either side of the upper to offer support and security. The Tivra is definitely a mold-breaker. Lightweight, open engineered mesh provides optimal comfort and breathability. TPU wing supports the foot during lateral and 360 movement. Lycra collar provides support and comfort. 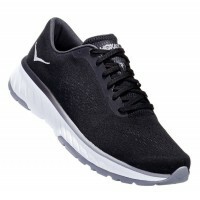 Rubberized foam midsole and outsole with rubber pods provides exceptional cushioned comfort that lasts and lasts. Heel pull tab for easy on/off. Rubberized foam outsole is non-marking and provides great traction on a variety of indoor and outdoor surfaces. Sidewall wrap-up design facilitates side to side movement. Active foot frame is adapted to cradle and support the heel during side-to-side and 360 movement. Hoka One One: Time to Fly! Hoka One One's roots are in the mountains, designing shoes that allowed athletes to run faster, safer and farther downhill. The result: a range of trail and road running shoes that puts performance and comfort first. With Hoka, your feet feel light gliding above the earth. Don't run, fly.